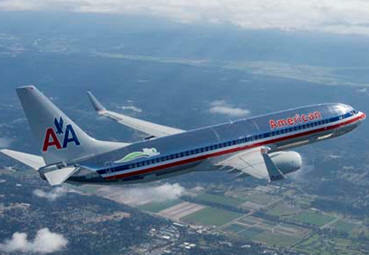 September 19, 2012 - Boeing and American Airlines on Tuesday showcased a Next-Generation 737-800 airplane known as ecoDemonstrator in Washington, D.C., to highlight testing of environmentally progressive technologies. The visit to the nation's capital follows extensive flight testing in Glasgow, Montana, where it flew a series of missions designed to test and accelerate advanced technologies that increase fuel efficiency and reduce airplane noise. "The ecoDemonstrator illustrates how we're pursuing technologies and advanced materials that make airplanes operate more efficiently and produce fewer emissions and less noise," said John Tracy, Boeing chief technology officer. "I am proud of the leadership role that Boeing is playing in advancing the science of aerospace and demonstrating the value of these technologies to our airline customers, the flying public, and to society at large." American Airlines is loaning a new Next-Generation 737-800 to Boeing to serve as the testbed for these advanced technologies. The flight testing completed in Glasgow allowed Boeing engineers to gather volumes of data about the viability of each technology. After testing is complete, the airplane will be returned to standard configuration and delivered to American later this year. "At American Airlines, we are working diligently to improve our carbon footprint. Reducing noise pollution, conserving fuel and waste minimization are just a few of the areas where we are making progress," said David Campbell, vice president of Safety, Security, and Environmental for American Airlines. "This is why it is so crucial for us to participate in programs like the ecoDemonstrator, so that we can test technologies that will continue to improve not only American's environmental performance, but our entire industry as well. We remain committed to doing our part to be good stewards for the environment." The FAA program known as CLEEN (Continuous Lower Energy, Emissions, and Noise) provided funding for the adaptive trailing edge on the airplane as well as some flight test costs. Other technologies on the 2012 ecoDemonstrator airplane include variable area fan nozzles, active engine vibration reduction, a regenerative fuel cell, and testing of flight trajectory optimization to enable more efficient routing for fuel savings. With fuel now the leading operating expenditure for airlines worldwide and increasingly stringent environmental regulations, improving fuel efficiency and reducing carbon and noise emissions is a top priority for the aviation sector. "Boeing is fully committed to helping airlines operate more efficiently, with reduced environmental impact," said Tracy. "We are committed because it is the right thing to do, and because meeting the environmental challenges we face will enable our industry to grow and broaden the benefits that aviation provides to global economic growth." The 2012 ecoDemonstrator is the first of several test platforms. Boeing plans to have one per year, with each airplane testing a new set of technologies. In 2013, a wide-bodied airplane will serve as the testbed. The FAA CLEEN program is also participating in the 2013 program, providing cost-share funding for a ceramic matrix composite engine nozzle and its related flight test costs.